Together for Short Lives is committed to collecting information from its members in order to support the development of services across the sector to meet the needs of children and young people with life-limiting conditions. 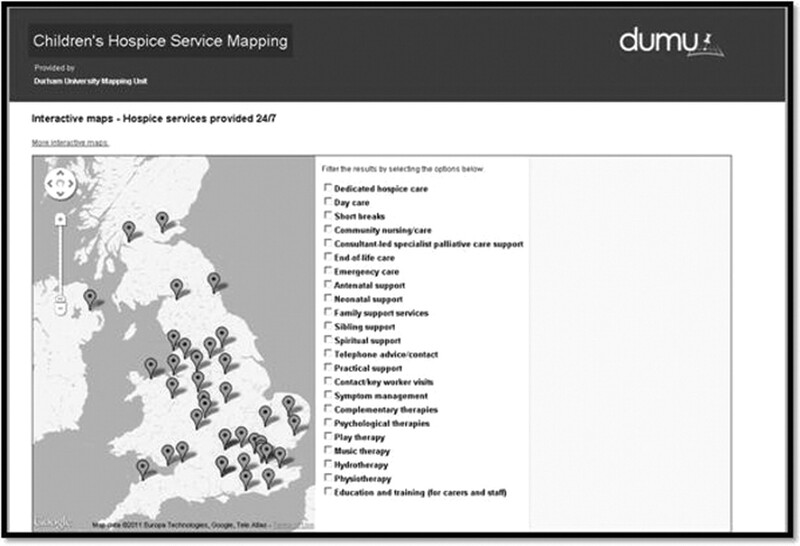 Since 2009, Durham University Mapping Team has collaborated with Children's Hospices UK (Formerly ACT and Children's Hospices UK) in developing more efficient ways of collecting data. ▶ Provide interactive geographical data maps to visually represent the services. Methods Durham University Mapping Team developed an online data collection system for reporting children's services in 2002 and a feasibility data collection was carried out in 2009/10 for children's hospices. The evaluation informed the 2010/11 data collection. The 2010/11 data collection involved each hospice registering with Durham University. Each hospice completed a questionnaire. Online reports were completed, summarising key data. ▶ 28 services provided information using ACT diagnostic categories: (N= 4,458 children and young people). ▶ 40% of 729 deaths happened in hospital (N= 45 services). ▶ Inform the Independent Funding Review Pilot work and service planning nationally. ▶ Bereavement support for the extended family. The map below shows the services that reported they provided at least one type of service on a 24/7 basis.